SOF-RUNNER® is built with four target areas in mind to give you assurance that every wheel is manufactured with quality components to provide unequaled performance. The unique grey polyurethane tread is mechanically bonded to the height impact polypropylene hub which eliminates tread separation. The precision sealed ball-bearing is insert-molded directly into the high impact polypropylene hub of the wheel. 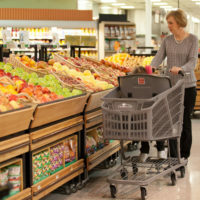 This eliminates shaking very common to shopping cart wheels and offers exceptional rolling ease. The stylish hub design incorporates a curved slope to provide improved resistance to side impact thrusts. Seals and protects ball-bearing from foreign objects and increases life of the hub assembly. SOF-RUNNER® completely eliminates the shaking common to polyurethane wheels. SOF-RUNNER® has re-invented the wheel with a tough tire molded from cast polyurethane known for it’s resilience and wear resistance. This technology has smoothed out the “bumpy” roll normally associated with the harder thermoplastic types of wheels. 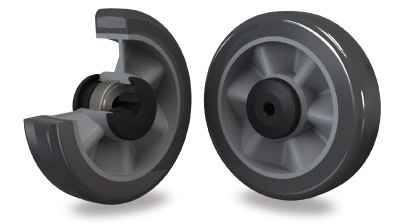 Unlike conventional wheels, The SOF-RUNNER® wheel hub has been redesigned with a curved slope to give it improved resistance to side impact thrusts so it can bounce back and keep running smoothly. SOF-RUNNER®, the ultimate luxury wheel, carries a 5-year warranty, that is pro-rated 20% per year against normal wear and tear. The warranty does not apply if the wheel is damaged as a result of improper use or flat-spotting caused by dragging the wheels.